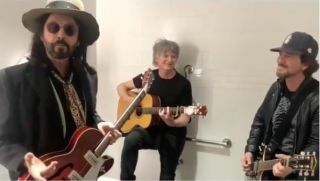 Current Fleetwood Mac guitarist Mike Campbell has been posting a series of "bathroom jams" on his official Instagram page during the band's current tour, and the latest clip shows Campbell joined by his Mac band mate Neil Finn and Pearl Jam frontman Eddie Vedder on an impromptu 12-bar blues workout. The short video was shot backstage at the Tacoma Dome in Tacoma, Washington, during Fleetwood Mac's stop at the venue on November 17. You can check it out below.